The studies for natural thermal insulation materials based on perlite began in Turkey over 10 years ago. 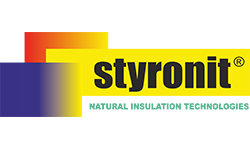 In 2008 the first certificates for Styronit products were released by TUV Austria in accordance with European and Turkish Standard institutes. Our Mission is to provide a natural thermal insulation solution by increasing the thermal comfort, creating a safer and healthier environment. Our Vision is to reach the benchmark supplier status among Romanian natural thermal insulation providers.